In spite of the fact that Europe allows Monaco to issue such a small number for a 2 euro commemorative coin, 16,000 units, we have the consolation that those who follow this blog, and you were interested in this currency, have been able to get it to its issue price. 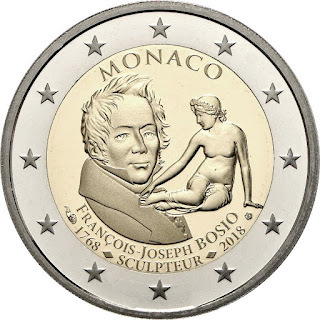 Now that the currency has already begun to be received by buyers, we will learn about the reasons that appear on the coin and about the character to whom this piece is dedicated, commemorating the "250th Anniversary of the birth of François Joseph Bosio". 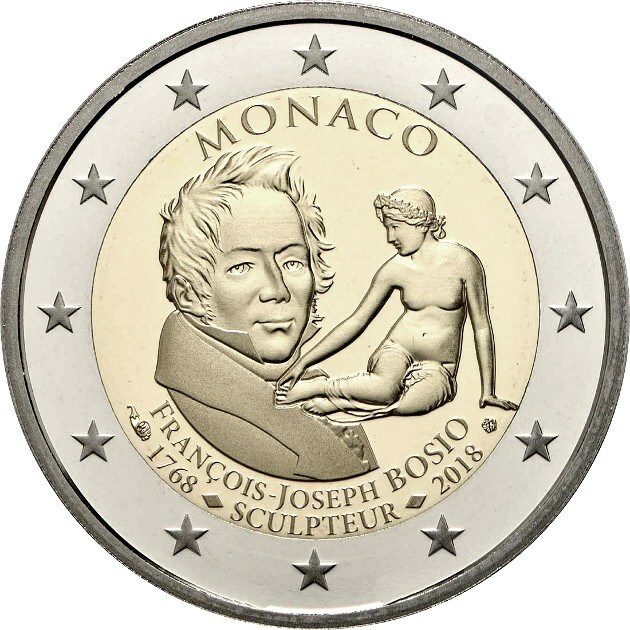 The central motif shows François Joseph Bosio next to his famous sculpture La Ninfa Salmacis which is in the Louvre Museum in Paris, below these the inscriptions «FRANCOIS-JOSEPH BOSIO» «1768 • SCULPTEUR • 2018», left the mark of mint of the Monnaie de Paris (Pessac) and to the right the mark of the mint teacher Yves Sampo. In the upper part there is the inscription «MONACO».